When I was making my best of 2009 lists one thing I mentioned was that I didn’t get to see a live performance from a single band that made my Top 10 releases last year. 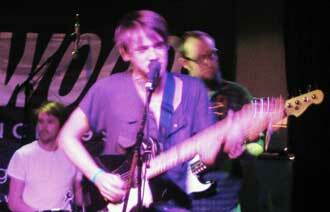 Topping the list of “wanting to see live bands” was Dappled Cities. I was thrilled when their label Dangerbird let me know that they would be playing a set here in LA on their way to their shows at SXSW. They played a very short set at the Aussie BBQ gig with 9 other bands yesterday. Their set was plagued with technical difficulties which is to be expected when you get a total of 50 minutes to set up, sound check and play a performance. But they were able to overcome that and tear through 5.25 songs from their latest release “Zounds” (listen to the recording, you’ll understand the .25 “song”). During a chance meeting on the street after the show, one of the guitarists gave us hope that they may be coming back through for a proper show this summer. In the meantime, catch them at SXSW this week, or at one of their many NYC shows later this month. If you’re not going to find yourself in Austin or Brooklyn this month, we’re putting up a recording of yesterday’s show for you to enjoy.